This season has been the most exhausting that I can remember. The racing itself has been exciting at times, predictable at others, but off track there has been nothing but argument, litigation, bad feeling, accusations and innuendo, to the extent that most F1 fans cannot wait for the deciding race in Brazil to be over so that we can look forward to a new year and, hopefully, a new start. One indicator of the quantity of unsavory events and scandals that have rocked the F1 world this year has been the never-ending parade of past champions only too happy to give their thoughts on things. We have become used to Niki Lauda making his unasked for and odd observations but when even Nigel Mansell decides to donate his thoughts, something unusual must be happening. Today Our Nige has criticized the McLaren management's handling of its drivers in 2007. "It is an internal problem with the team who have demonstrated to the world that they have not managed their drivers very well," opined Mansell, ruefully reflecting on his own brief experience of driving for Ron Dennis in 1995. He feels that Alonso probably had terms in his contract that were not met, judging from his own experience. Interestingly, Mansell's old buddy and former team mate, Nelson Piquet, has also been moved to comment and disagrees with Nigel. Nelson says that the problem has been that McLaren have been completely equal in their treatment of the two drivers, leading Alonso to try to play mind games with Hamilton and Dennis to gain an advantage. "His objective was to psychologically destabilise Hamilton, as I used to do with (Nigel) Mansell by saying his wife was ugly and he was dumb... But he doesn't seem to have managed to do that with Hamilton, while with Dennis their relationship seems irremediably compromised to me." That seems to me a much more acute observation of what has been going on, especially when we remember the video of Alonso baiting Massa after their bumping and barging session earlier this year; the smile in Alonso's eyes as he turned away to proceed to the podium, leaving Massa fuming and frustrated, made it quite clear that he knew what he was doing. But the view of the old stager varies according to his own perspective, it seems; Alain Prost has chimed in with the opinion that Alonso should have been given number one status from the start. 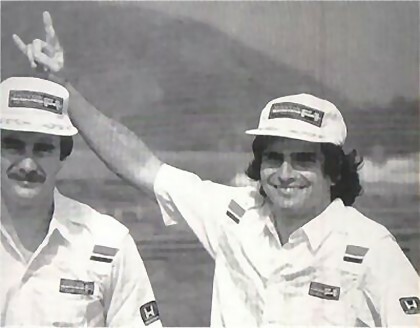 Referring to his own time with the team, Prost maintains that Senna was always Ron's favorite and received more protection as a result. Which may be true but ignores the fact that equal equipment for their drivers has always been McLaren's policy. To complain about the team manager having a better relationship with one's team mate strikes me as being immature and unrealistic - of course we all get on better with some people than we do with others; that's part of being human. It does sound like a bunch of old warriors using the situation to air past grievances. Even Nelson could not resist the reminder of his digs against Mansell. Clearly, they miss the cut and thrust of F1 competition and will take any opportunity to get back in there; but they merely stir the pot and keep things boiling with all their remarks, leaving the fans thoroughly fed up with all the nonsense and, probably for the first time in their lives, wishing that the season would end. And I am left wondering whether it will all go away, just because a new year has started. With luck, some of the unnatural pairings will have been sorted out by then, Fernando back with Papa Briatore, a more stolid personality provided with the second McLaren seat, Kimi more recognizably number one at Ferrari, and Nico Rosberg still where he belongs, in a Williams. But we may be reckoning without the disruptive influence that the the FIA has become under the baleful influence of Max Mosley. Should, for instance, it become obvious that the championship is a battle between BMW and Ferrari, can we expect more ludicrous protests and rulings to keep the fight alive to the end? And Flavio may be all in favor of the FIA while it attacks McLaren but he knows that it will be his turn again should the Renault return to competitiveness in 2008. Whatever happens, you can be sure that, if you see the old champions popping up to have their say, something is still rotten in the state of F1. I have never TRUSTED Ron Dennis and of course I'm immediately reminded 'He's a pillar of F1', blah, blah, blah. Few have left McLaren 'happy'. Enough said. How many star drivers have admitted that they want equal treatment though? I've grown to respect him. Maybe his system is flawed, but it is his system and his team, most drivers knew that going into the team. I respect Ron too, Dan. He has stuck to his policy of equal equipment for the drivers and all were employed knowing this was the policy of McLaren. We might not think it's the right policy but you have to admire the guy for not giving in to pressure for changes.